DSXpressSERVER is a robust solution capable of running a network of over 1000+ SignagePlayers via private LAN, WAN, VPN or over the Web. The DSXpressSERVER – an affordable, self-hosted digital Signage solution for medium to large size networks. Simply purchase the DSXpressSERVER appliance, plug it to your network, go through the general setup guide and start managing your Digital Signage network of SignagePlayers. 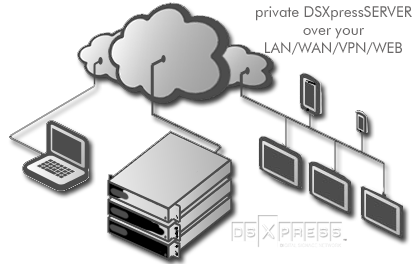 The DSXpressSERVER has an unbeatable price with a flexible licensing model. The DSXpressSERVER is sold for a one time affordable cost. In addition you will want to get the total number of licenses to accommodate your entire Digital Signage network. Each license accounts for one PC running the SignagePlayer application and powering one or more screens. The cost per license is reflective of the total number of licenses purchased at one time. The DSXpressSERVER is designed to deliver uninterrupted service to thousands of concurrently connected Digital Signage and Kiosk screens. Managing a privately hosted DSXpressSERVER, delivers high security level and independence which many companies often require. And while the SaaS model is more affordable, when it comes to true ownership and management over your network, nothing beats a privately hosted DSXpressSERVER solution. It’s the best of both worlds - DSXpressCLOUD & DSXpressSERVER. DSXpressSignage also offers the DSXpressSERVER Hybrid edition, a private hosted server managed by us. With the Hybrid edition we (DSXpressSignage) host, manage and support your DSXpressSERVER, while providing you UNLIMITED SignagePlayer licenses, all for a one low monthly fee. In other words, with the DSXpressSERVER Hybrid edition you do not pay per license / player (it’s like the DSXpressCLOUD) but still get to own your dedicated private server (like the DSXpressSERVER). You don’t have to worry about management or maintenance, we do it all for you. You get a dedicated DSXpressSERVER that doesn’t share its resources (bandwidth / storage) with the rest of our worldwide user base. The DSXpressSERVER Hybrid edition gives you the peace of mind you need, knowing that at anytime you can convert the Hybrid server to a truly privately hosted server. Often business investors require that you own all aspects of your organization including software and hardware; the DSXpressSERVER Hybrid edition allows you to satisfy that requirement while keeping your investment funds in the bank . A privately hosted server solution allows you full access to all the features you fell in love with in our software as a service (SaaS) model. You get full access to the SignagePlayer Web and Desktop versions, SignageStudio Web and Desktop versions as well as to the EnterpriseStudio; but now all the applications will access your hosted server for both management and presentation playback. What’s the right solution for you? DSXpressCLOUD is a cloud based Digital Signage (also known as SaaS or software as a service). It is a subscription based model. Each Player can be connected to one or more screens. All of your media files (videos, animations etc) are stored on our servers and stream down to each remote Player. The media files are locally cached on the remote Player so they do not depend on a constant internet connection. DSXpressSERVER is a privately hosted server solution. The server software and hardware are purchased and owned by you. All the licenses for the players are also owned & managed by you. With the DSXpressSERVER you do NOT pay a subscription fee; however there is an optional updates and support annual fee. The DSXpressSERVER is designed to deliver the same features as the DSXpressCLOUD, but in a privately hosted server. The DSXpressSERVER can be installed on any PC running Microsoft Windows 2008 Server. © Copyright 2012 Advanced Advertising Graphics, Inc. All Rights Reserved.